Breakfast of champions! These protein pancakes are used with Navita's Organics Vanilla & Greens plant-based protein powder which helps support digestion, contains antioxidants and has complete proteins all in one! 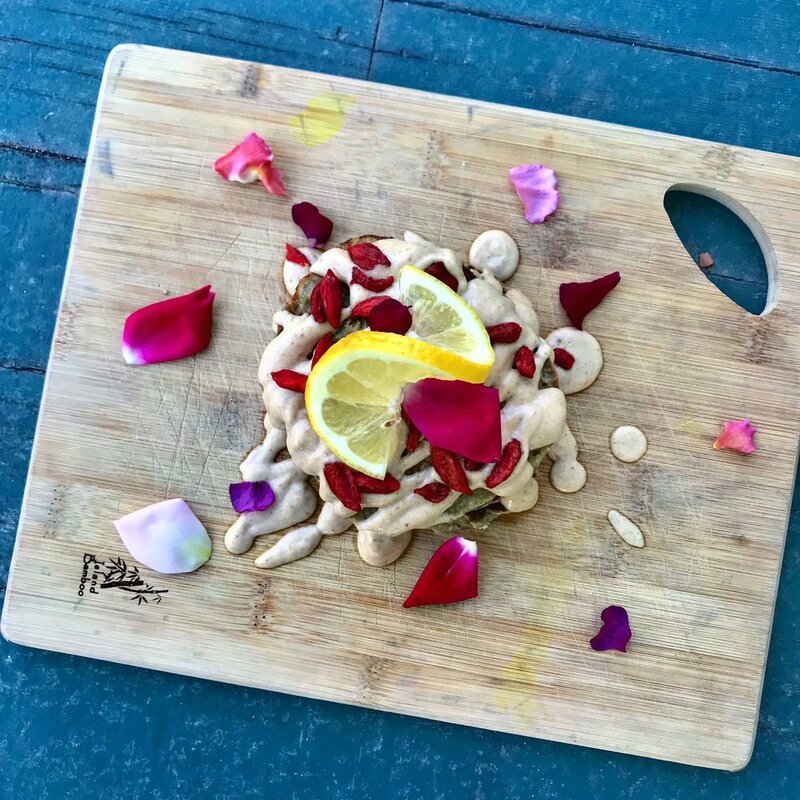 Drizzled with lemon tahini syrup; sweet and zesty with a natural energy boost because of this magical stuff called maca powder. Top it off with some goji berries which are full of antioxidants, vitamins and minerals. So pile those pancakes high and don't feel bad about eating all of them because nature is looking out for you! 1. Blend all of the pancake ingredients together in a high speed blender. It should turn out a little thicker, like normal pancake batter. 2. Heat oil in a skillet over medium heat. Poor batter on skillet and cook 3-4 pancakes at a time. Cook for about 2 minutes (or until golden brown on the bottom and easy to flip) and then flip to the other side, cook for another 2-3 minutes. 3. Repeat until you have used up all the batter! 4. Combine all of the lemon tahini syrup ingredients together in a high speed blender. Blend until smooth. Heat in microwave for about 30 seconds. 5. Top your pancakes with all the goods and get fueled up for the day!